A question on X validated on the comparative merits of L¹ versus L² estimation led me to the paper of Stephen Portnoy and Roger Koenker entitled “The Gaussian Hare and the Laplacian Tortoise: Computability of Squared-Error versus Absolute-Error Estimators”, which I had missed at the time, despite enjoying a subscription to Statistical Science till the late 90’s.. 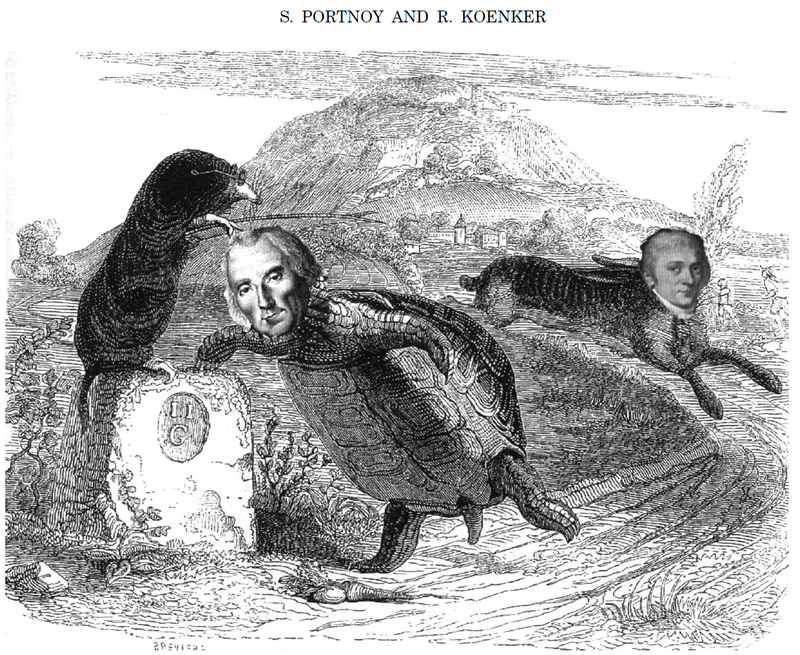 The authors went as far as producing a parody of Granville’s Fables de La Fontaine by sticking Laplace’s and Gauss’ heads on the tortoise and the hare! This entry was posted on October 19, 2018 at 12:18 am and is filed under Books, Kids, pictures, Statistics, University life with tags absolute error, Carl Friedrich Gauss, cross validated, hare, La Fontaine, Le Lièvre et la Tortue, Pierre Simon Laplace, quantile regression, rien ne sert de courir, squared error, Statistical Science, tortoise. You can follow any responses to this entry through the RSS 2.0 feed. You can leave a response, or trackback from your own site.